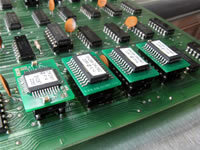 With respect to repairing the CCPU circuit board used in several Cinematronics an VectorBeam games, you might be interested to know that there are alternatives when it comes to replacing the custom EPROM and BPROM chips. The following devices are direct plug-in replacements for the original chips. 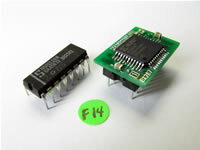 Each BX288 module is individually programmed for a specific location. Once programmed, it must be used in that location. They are not interchangeable. 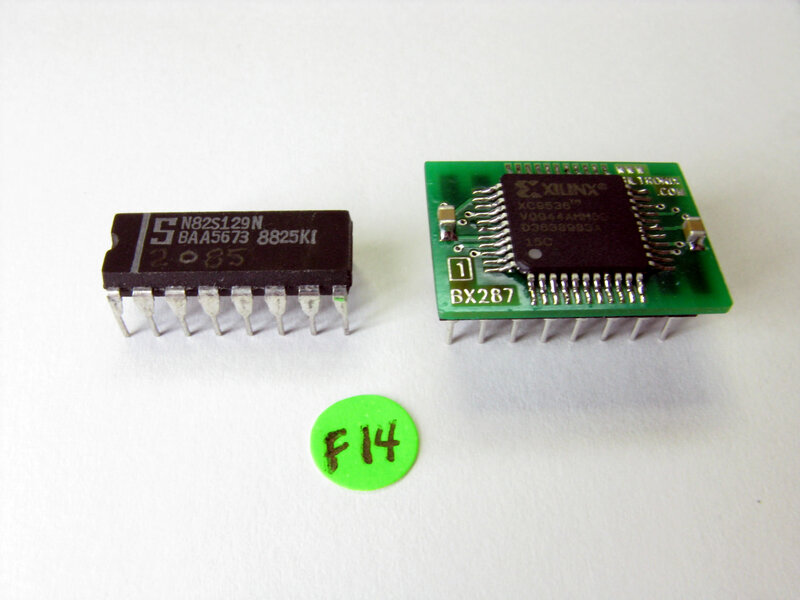 You may purchase these BPROM replacements individually for $12.00 USD each plus shipping (quotes done on request and combining all items ordered). You must specify the location for which the chip should be programmed. Each unit is labeled, programmed, and tested before shipping. If you would like me to program the BX288 module for use in another game (not a CCPU board), just send me the binary PROM file. Be aware that I cannot test these units for other games so they are sold as "code verified but untested". I cannot accept returns since I cannot be responsible for problems due to incorrect files or incorrect installation. 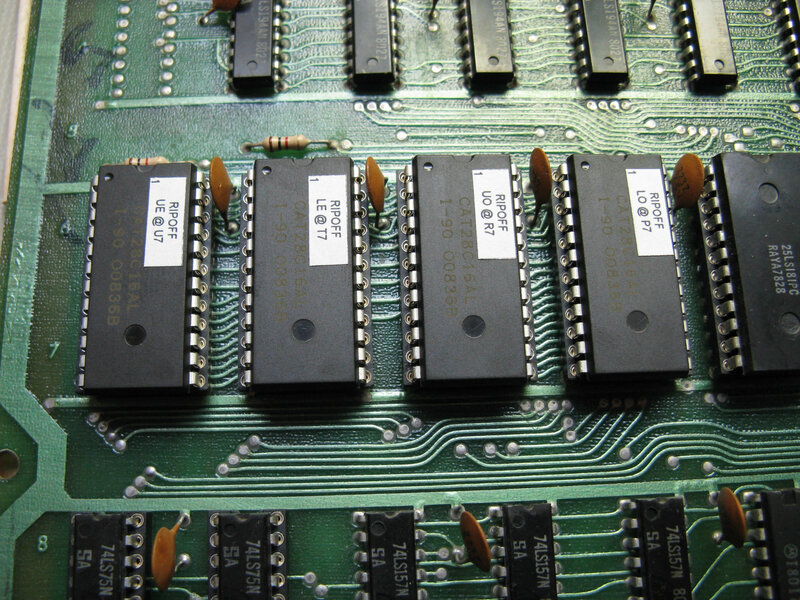 The 74S288 type bipolar PROM (32 words x 8 bits) was very common in the 1970's up until about 1985. 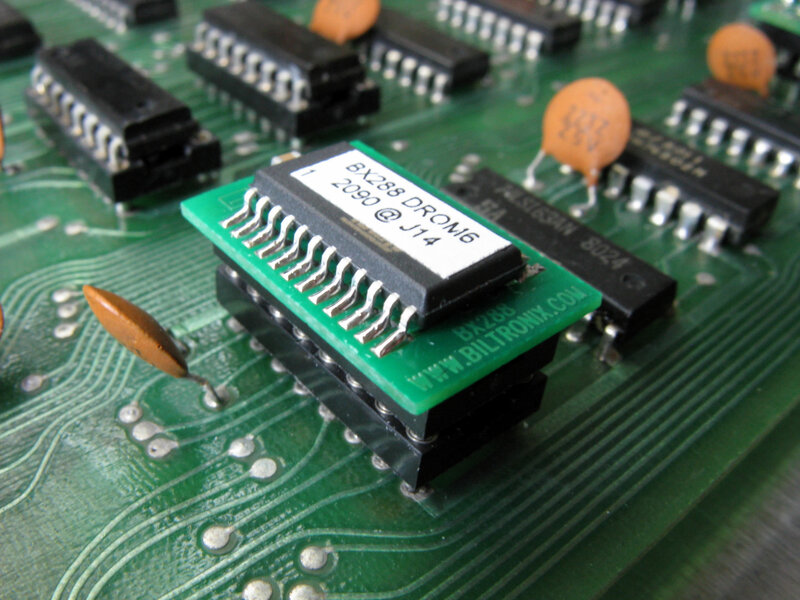 Similar chips with the same pin-out and functionality were supplied by many manufacturers. A few equivalent part numbers are shown below. Any of these devices might appear in your CCPU board. The BX288 will replace any of the following parts. Each BX287 module is individually programmed for a specific location. Once programmed, it must be used in that location. They are not interchangeable. You may purchase these BPROM replacements for $20.00 USD each plus shipping (quotes done on request and combining all items ordered). Each unit is labeled, programmed, and tested before shipping. If you would like me to program the BX287 module for use in another game (not a CCPU board), just send me the binary PROM file. Be aware that I cannot test these units for other games so they are sold as "code verified but untested". I cannot accept returns since I cannot be responsible for problems due to incorrect files or incorrect installation. The 74S287 type bipolar PROM (256 words x 4 bits) was very common in the 1970's up until about 1985. 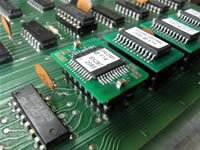 Similar chips with the same pin-out and functionality were supplied by many manufacturers. A few equivalent part numbers are shown below. Any of these devices might appear in your CCPU board. The BX287 will replace any of the following parts. 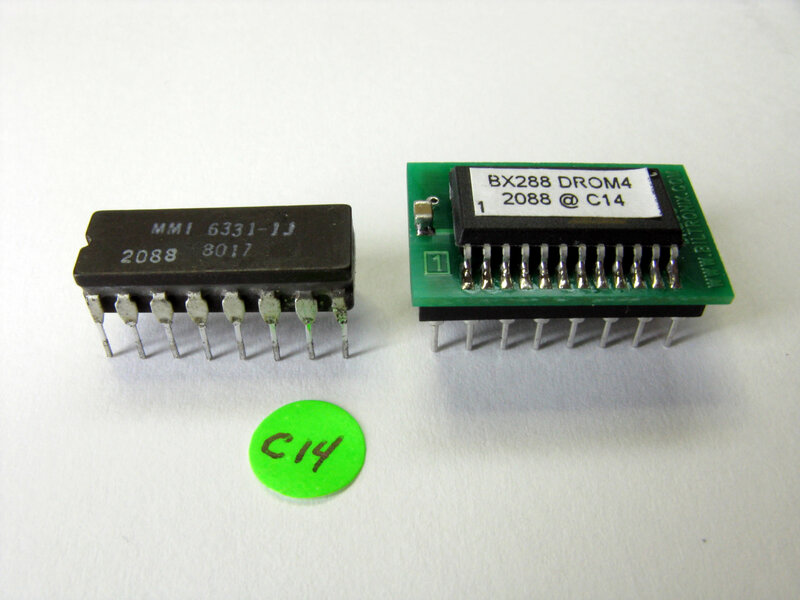 Installing the BX288 and BX287 modules is the same as plugging any DIP chip into a DIP socket. 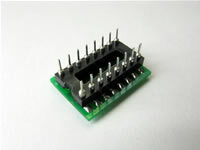 Simply align pin 1 of the module with pin 1 of the PCB socket and plug it in so that it is fully seated in the socket. 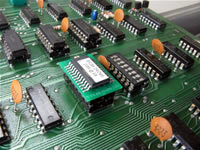 Be aware that if you plug the chip into the socket backwards and power up the game, the module will be instantly destroyed and you'll have to purchase another one, so be careful! Label text is readable when pin 1 is at lower left. Label has a dot indicating pin 1 at lower left. indentation toward the end with pin 1. The PCB itself has an obvious  symbol close to pin 1. 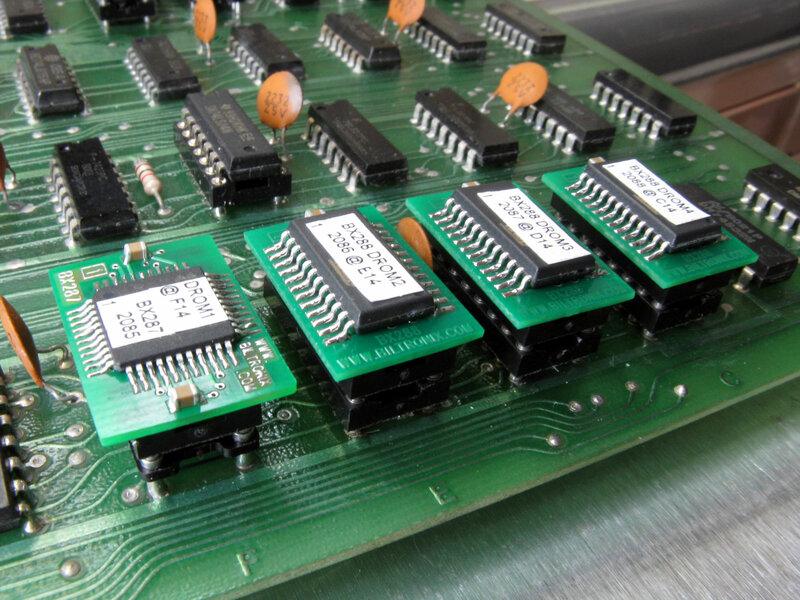 If your original BPROM chips are soldered into the board, you'll obviously have to carefully remove them first. While you could then solder the new modules into the PCB, I strongly recommend that you take the opportunity to install new good quality DIP16 sockets into the PCB. That way you can easily plug the modules into the sockets and if you ever have issues in the future, you can easily remove them or swap them out or whatever you need to do without any hassles. The 28C16A is a flash type reprogrammable EEPROM that can directly replace the 2716 chip. Simply program it using the binary game ROM file and plug it in. No chip or board modifications are required. Be aware that this chip will only replace the 2716. Boards modified for use with 2732 (i.e. Armor Attack, Solar Quest) are not supported. Any game that runs on 2716 chips will work (i.e. Star Castle, RipOff). 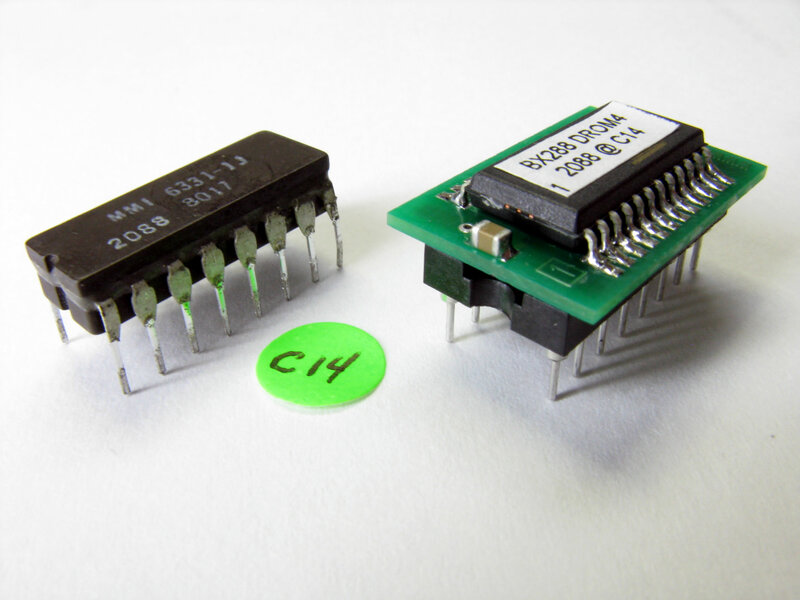 These chips were manufactured by Atmel (AT28C16A), Microchip (28C16), Catalyst (CAT28C16A), and possibly others. 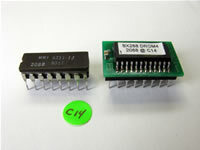 You may purchase the 28C16A EEPROM chips from anywhere you like and send them to me for programming. Or, if you prefer, I can order them myself on your behalf but I will have to charge you for the parts and the shipping plus a little for my effort. I will label, program, verify, and if I have the appropriate game, test them and return them to you ready for use. You must specify the game for which the chips are to be programmed or you can provide the binary ROM file of your choice. The programming service fee is minimal. 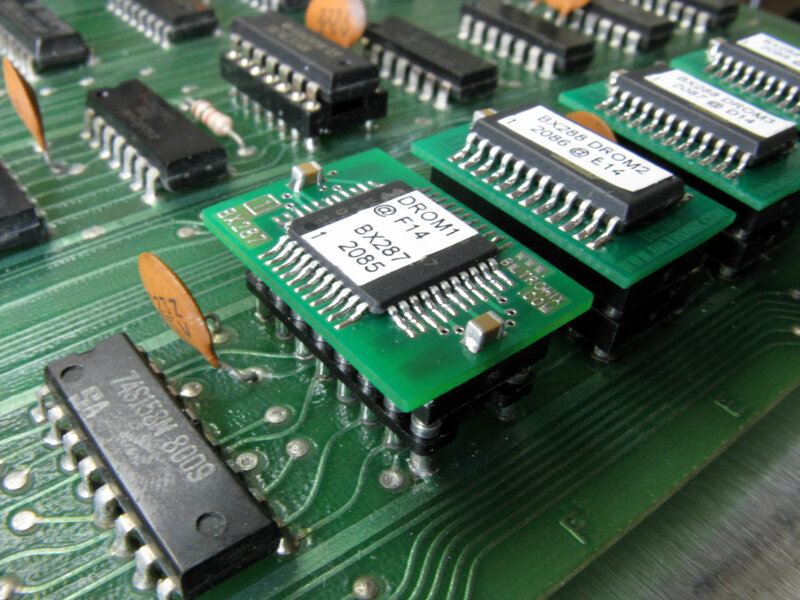 At this time, I only have a few chips left in my stock but if I am repairing your Cinematronics or Vectorbeam CCPU board and you want me to replace your original EPROMs with the 28C16A, I can do that. 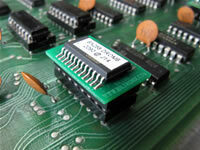 If you don't want a full set, you must specify the location for which the chip should be programmed. I realize that the above price might seem a little high. To sell these, I first have to purchase them myself, then label, program, and test them. I then have to pack, weigh, and ship them. However, keep in mind that the 28C16A is a superior device to the 2716 part. 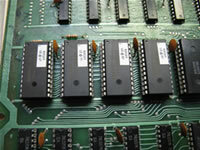 For information on the Battlezone Aux board bipolar PROM chip replacements, go here.